Despite warming waters, there’s still some yellowtail around especially around Espirito Santo Island north of La Paz where Bill Fong from the Sacramento area go this hefty forktail. We have taken more wahoo in the last 2 months than we’ve taken in the last two years! 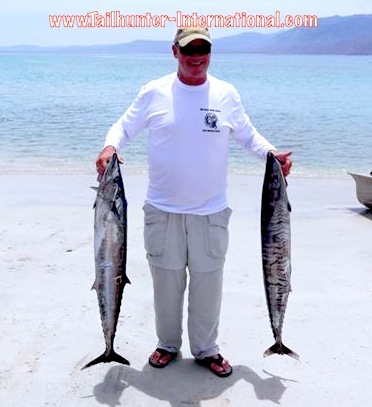 First timer and fishing only ONE day, Randy got these two 20-30 pound class wahoo at the south end of Cerralvo Island. 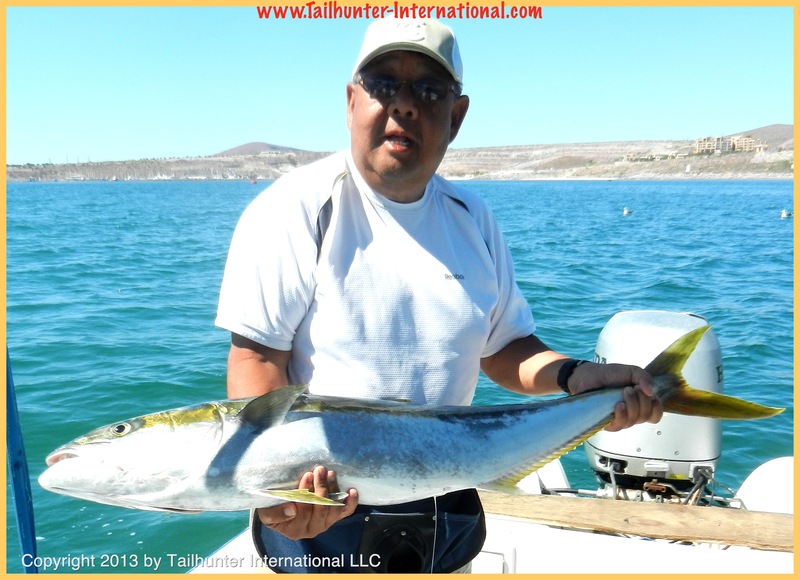 These are what we all “firecracker yellowtail.” There seems to be nice schools of this fun-sized ‘tails in various places available to both our La Paz and Las Arenas fleets. 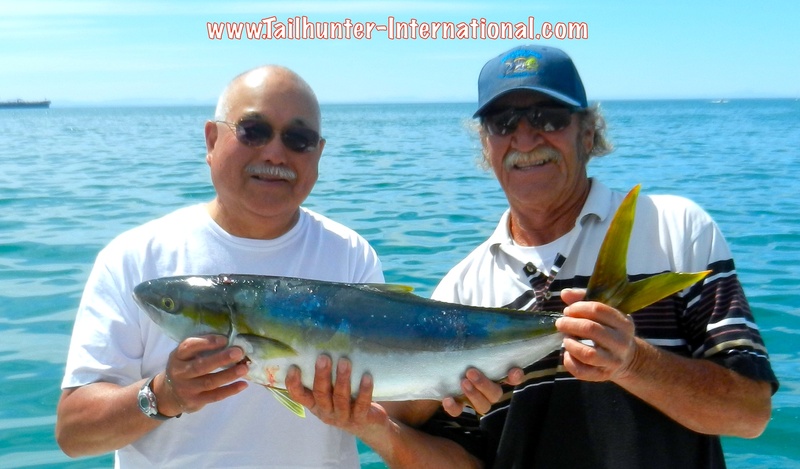 Dennis Fujii and Captain Alfredo pose with a nice schoolie. Another of our Canadian friends, Faron Kilber, poses with the nice-grade of cabrilla that are biting in the rocky areas right now. Our largest this week was about a 25-pound pig! It was an up-and-down week of fishing with more of those pesky winds some days and then flat calm waters in between plus maybe a tad of full-moon thrown in. Most days, however, were gorgeous, but big swells generated from the south still made it a bit bumpy even with other conditions were super. The result was a week of fishing as variable as the weather. Again, it’s “transition” time between colder and warmer fishing seasons so we had changes in water plus about that many different types of fish as well. One day all the fish seemed to be inshore fish. The next day the off-shore fish were lock jawed and only the blue water species bit. Other days it was a mad mix of a little of this…a little of that. 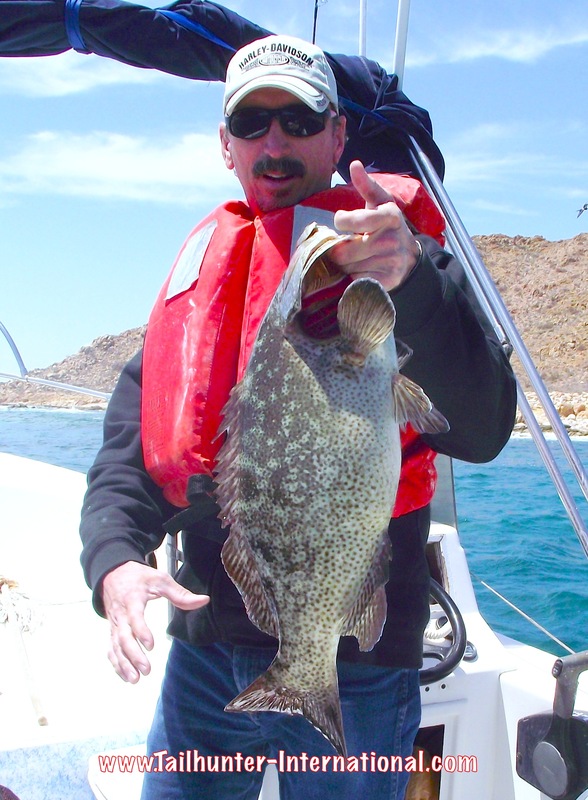 I counted 15 different species of fish caught last week between our Tailhunter Las Arenas and our Tailhunter La Paz fleet. With the offshore stuff, we again got into a few wahoo that were in the 20-40 pound class and a few large tuna were hooked (and lost) that were estimated in the 60-80 pound category. As well, we’re starting to see a few billfish again and several were hooked (and also lost on light tackle, but a nice thrill just the same for a while when they were hooked). Inshore, there’s been a lot of activity. Pargo continue to torment the anglers with only about 2 or 3 put in the boat for every 10 hooked. That’s just the way it is! These are tough exciting fish, but their first move is right to the rocks so they have the “edge” in more ways than one! If you look our our daily scores, in fact, it seems like fishing has really been bad some days, but then talking to the captains or the clients, you find out they lost 2, 3, 4…6 fish to breakoffs or errors! Same for the yellowtail. There’s still some nice YT’s around, but not as much as last month as we are no transitioning to warmer water conditions. The size has also varied. We’re getting some as small as 5 pound firecracker yellowtail up to about 30-40 pound sluggers. Best areas are around the islands especially northern Cerralvo and the west side of Espirito Santo Island. In those same areas, we’ve been hooking some really nice fat cabrilla (Mexican sea bass) up to about 25 pounds and even some small grouper. Along the beaches, we saw an increase in the number of hooked rooster fish and jack crevalle running up to about 30 pounds and the waters are still cool enough for the guys to be hooking a handful of sierra each day, not counting the bite-offs.